Is é an rud is ábhar don leathanach seo ná an chathair. Más suim leat ciall eile an téarma seo, léigh Nua-Eabhrac. Cathair le 8,622,698 (meastachán, 2017) duine í Cathair Nua-Eabhrac, atá suite ar chósta thoir thuaidh Stát Aontaithe Mheiriceá (S.A.M.). Is í an chathair is mó daonra i Stáit Aontaithe Mheiriceá. Ina theannta sin, nuair a chuirtear daonra a mbruachbhailte léi, is gaire do 20 milliún atá inti (sa bhliain 2010). Ar oirthear inbhear an Hudson atá sí, le New Jersey ar an dtaobh thiar den abhann. 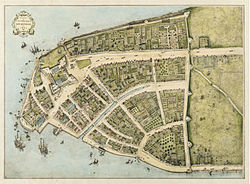 Is í an chathair is mó i stát Nua-Eabhrac í.
Manhattan sa bhliain 1660. Tá an tuaisceart ar dheis. I mí Aibreán 1524, tháinig Giovanni da Verrazzano ar an áit ina bhfuil Cathair Nua-Eabhrac inniu. Bhí ar an laghad 5,000 duine den phobal Lenape ina gcónaí ann cheana. Taiscéalaí Iodálach i seirbhís choróin na Fraince, bhaist sé Nouvelle Angoulême ar an áit. Tháinig na Spáinnigh sa bhliain 1525 chun an cósta a thaiscéaladh (Río de San Antonio a bhaist siad ar an Hudson). Sa bhliain 1609, tháinig Henry Hudson, taiscéalaí Sasanach i seirbhís Comhlacht Dúitseach na nIndiach Thoir, ar Chuan Nua-Eabhrac arís agus é ag iarraigh an Pasáiste Siar a aimsiú. Sheol sé thuas an abhainn a thabharfadh na hOllannaigh an Abhainn Thuaidh uirthi. ("An Mhuiris" a thug Hudson féin uirthi in onóir Muiris, Prionsa Oráiste.) Scríobh chéad mhata Hudson gur "Cuan an-mhaith le haghaidh an uile ghaoth" a bhí inti agus go raibh sí "míle slí leathan" agus "lán d'éisc"." Thosaigh an inimirce ón taobh amuigh sa bhliain 1614 nuair a chuir an chéad eachtrannach faoi i Manhattan, fear de shliocht Afracach agus Pórtaingéalach a rugadh i Santo Domingo darbh ainm Juan Rodríguez (Jan Rodrigues sna foinsí Ollannacha). Tháinig coilínigh ón Ísiltír ag tosnú sa bhliain 1624. Sa bhliain 1626 cheannaigh Peter Minuit, stiúrthóir na coilíneachta, an t-oileán Manhattan ó na Lenape. Níor thug sé mórán air: go traidisiúnta deirtear gur thug sé luach $24 d'earraí air. Athainmníodh an áit Nieuw Amsterdam (Amsterdam Nua) agus trádáil i bhfionnaidh an ghníomhaíocht eacnamaíoch ba mhó a rinneadh ag an tús. Sa bhliain 1664, rinne na Sasanaigh ionraic ar an gcathair agus thug siad New York air in onóir Diúc Eabhrac agus Albany. Ag deireadh an Dara Cogadh Angla-Ollannach, fuair an Ísiltír smacht ar Shuranam, agus mar mhalairt, fuair na Sasanaigh teideal ar Nova Amsterdam. Bhí tuarastal láir $38,293 in aghaidh an duine sa chathair sa bhliain 2000, agus tuarastal láir $41,887 in aghaidh an líon tí. Bhí tuarastal láir $37,435 ag fir, agus $32,949 ag mná. Bhí méanthuarastal $22,402 ag muintir na cathrach. Bhí 21% den daonra agus 19% de líonta tí faoin líne bhochtaineachta. Ón líon atá ag maireachtáil i mbochtaineacht, bhí 30% faoi bhun aois 18 mbliain agus 18% 65 mbliain nó os a chionn. Sa bhliain 2000, bhí 8,008,278 duine, 3,021,588 líon tí, agus 1,852,233 clann ag maireachtáil sa chathair. Bhí dlús daonra 10,194/km² (26,403/mi²) ann. Bhí 3,200,912 aonad tís, ag meándlús 4,074.6/km² (10,553/mi²). Maidir le cine, Bhí 45% Bán, 27% Gorm , 0.5% de Mheiriceánaigh Dúchais (Indiaigh Mheiriceá Thuaidh), 10% Áiseach, 13% de chiníocha eile, agus 5% de dhá chine ar a laghad. Bhí 27% den daonra de bhunadh Easpáinneach, a d'fhéadfadh baint le cine ar bith. Bhí thart ar milliún go leath daoine de bhunadh Éireannach i Nua Eabhrac. Bhí 3,021,588 líon tí, agus bhí leanaí faoi bhun 18 ag maireachtáil le 30% acu. Ba daoine aonair iad 32% de iomlán an uimhir líonta tí, agus bhí duine 65 mbliana ar a laghad ag maireachtáil le 10%. 2.6 an meán líon tí, agus 3.3 an meán líon clainne, tuismitheoirí san áireamh. Sa chathair bhí 24% faoi bhun aois 18, 10% ó 18 go 24, 33% ó 25 go 44, 21% ó 45 go 64, agus 12% atá 65 bliain ar a laghad. 34 bliain ba ea an lár-aois. Bhí 100 bean in aghaidh gach 90 fear. Bhí 86 fear in aghaidh gach 100 bean os cionn 18 bliana. Toghann gach ceann den chúigear Uachtarán Buirge, ach faoi chairt na cathrach tá cumhacht teoranta ag uachtarán—tá buiséad beag discréideach aige nó aici le caitheamh ar thionscadail laistigh den bhuirg. (Cuireadh deireadh leis an gcumhacht tábhachtach deiridh a bhí acu—ball de Bhord an Oideachais a cheapadh—leis an mbord féin, ar 30 Meitheamh 2002.) Faoi láthair, bíonn uachtaráin na mbuirgí mar bhaill ex officio ar bhoird agus choistí éagsúla. Tugtar "na Cúig Bhuirg" go minic ar iomlán na cathrach, ag úsáid an téarma "An Chathair" nó "The City" le haghaidh Manhattan, an t-oileán lárnach. Tugtar "na Buirg Lasmuigh" ("the Outer Boroughs") ar na ceithre cinn eile. Freastalaíonn timpeall is 1.1 milliún páiste ar bhreis is 1,700 bunscoileanna agus ardscoileanna, agus is é an córas oideachais poiblí i gCathair Nua-Eabhrac an ceann is mó sna Stát Aontaithe. De sheanbhunús is ea na naoi scoil dara leibhéal speisialaithe a fhreastalaíonn ar mhic léinn a bhfuil talann faoi leith acu. Tá isteach is amach ar 900 scoil príobháideacha sa chathair, idir neamhsheicteach agus reiligiúnda. Tá calafort mór ar a bruacha, ach tá go leor dá cuid gnó caillte ag Nua-Eabhrac le calafoirt eile, mar Elizabeth i New Jersey. Tá Aerphort Idirnáisiúnta John F. Kennedy i Nua-Eabhrac, chomh maith le haerfort intíre La Guardia, iad araon in Queens. Tá Aerfort Idirnáisiúnta Newark Liberty ar an taobh thiar de abhainn an Hudson, i New Jersey. Tá dhá stáisiún traenach mór inti, Grand Central Station, as a bhfágann traenacha Metro North, agus Stáisiún Pennsylvania, nó Penn Station mar a thugtar air de ghnáth, atá á úsáid ag an Long Island Railroad agus ag an gcóras Amtrak. Bíonn an córas iompair poiblí i gCathair Nua-Eabhrac ar siúl 24 huaire sa lá, agus iompraíonn sé gach tríú paisinéir a úsáideann córas iompair poiblí sna Stáit Aontaithe. Tá cáil ar an New York City Subway. Is é an córas iompair phoiblí is mó ar domhan ó thaobh an líon stáisiún ann agus fad na rútaí éagsúla. Ní stadann an subway thar oíche dála an chuid is mó de na córais ar fud an domhain. Sa bhliain 2015, baineadh úsáid as an gcóras subway 1.76 billiún uair. Is é Grand Central Terminal ("Grand Central Station") an stáisiún traenach is mó ar domhan ó thaobh líon na n-ardán de. Is ceantar gnó mór í Nua-Eabhrac. Ar Wall Street, ar dheisceart Manhattan, atá gnó an infheistíochta bunaithe, agus fostaíonn sé na mílte. Cathair mhór daorchluiche atá inti, ó laethanta na Brooklyn Dodgers i leith. Tá Nua-Eabhrac ina baile dúchais de dhá fhoireann a imríonn ag leibhéal na Sraithe Móire. Sa Staid Yankee sa Bhronx a imríonn na New York Yankees, agus na New York Mets i bPáirc Citi, Queens. Ó thaobh na peile Meiriceánaí den scéal, tá dhá fhoireann de bhunadh na cathrach ag imirt ag an gcéim is airde (NFL) - mar atá, na New York Giants agus na New York Mets. Tá a gcluichí baile á imirt acu in aon staid amháin - Staid MetLife in Rutherford Oirthear, New Jersey. ↑ Rankin, Rebecca B. (1948). "New York: The World's Capital City, Its Development and Contributions to Progress". Harper. ↑ Homberger, Eric. Owl Books. The Historical Atlas of New York City: A Visual Celebration of 400 Years of New York City's History, 2005, p. 34. ISBN 0805078428. ↑ "New York City Department of Education – About Us" (2014). ↑ "Private School Universe Survey". ↑ "The MTA Network: Public Transportation for the New York Region". ↑ "Commuting in America III: Commuting Facts" (PDF). Spéirlíne Chathair Nua-Eabhrac ón Empire State Building. Tugadh an leathanach seo cothrom le dáta an 30 Meitheamh 2018 ag 04:33.